Four years ago Viet Vu was working full-time as a paralegal. Feeling bored and unenthusiastic about his profession he determined that the only way he could grow in his career was to apply to law school. Attending law school to become a lawyer was not something he wanted to do. He didn’t know what to do, but he did know that he wanted to be more creative and independent. Viet became interested in brewing through his father, who was a brewer. The two talked about opening a brewery together one day but that dream would never be able to become true as a result of his father contracting liver cancer and eventually passing due to the disease a few months later. For a time Viet thought that his dream of starting a brewery ended with his father’s passing. However, a year later he decided to cash in his 401K (which in hindsight he doesn’t recommend doing! ), and enroll at the same brewing school his father had studied at years prior. Viet eventually graduated brewing school in the summer of 2011. He then enrolled in Renaissance’s Business Planning class and it took two more years of working as a Contract Analyst and saving every penny before he decided to launch Hoi Polloi Brewpub and Beat Lounge. After four years planning and just two years since launching, Hoi Polloi is still in its infancy. Viet finds he is still constantly learning and making changes. A business plan seems solid, but it’s not. Be prepared for inevitable changes. 3. Get advice. But don’t necessarily take it! Every one has something to say. It’s up to you to use critical thinking and make the best decision. 4. Pay for your time if you can afford it. Hire people to do administration and bookkeeping. Business can be all-consuming, but don’t let it be. Your brain needs time to refresh. Don’t burn-out! I read this article and found it very interesting, thought it might be something for you. 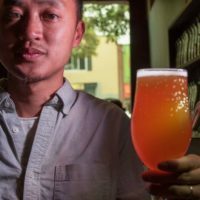 The article is called Viet Vu and Hoi Polloi Brewpub and Beat Lounge and is located at https://www.rencenter.org/viet-vu-hoi-polloi-brewpub-beat-lounge/.